This is one giant box of ammo! 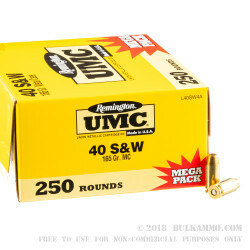 Remington has stepped up and created the size box every manufacturer should carry. It’s a well-organized cardboard ammo box with 250 rounds in trays stacked four high. That’s a massive amount of ammo. With this order of 1000 rounds, you will get 4 of these boxes. Don’t waste time fiddling with those dinky boxes and trays! 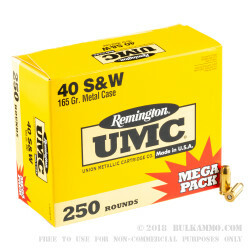 These boxes are marked 165gr MC, that stands for Metal Case, which is Remington’s equivalent of a full metal jacket. All these rounds are new production, brass-cased, boxer-primed, non-corrosive, and reloadable. These are a staple for range and target practice by law enforcement, and avid shooters. These rounds are non-expanding FMJ rounds. They’re great for target practice, tactical training, and plinking. It is important to dedicate time to training with your firearms. Practice does indeed make perfect. Better yet, perfect practice makes perfect! 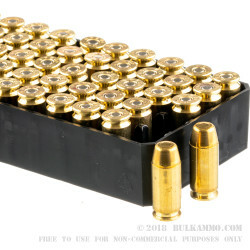 This is a good medium weight round which is good for practice because they still have good speed and are heavy enough to give you a taste of the greater power of a defense round; at 165 grains. They have a muzzle velocity of 1,150 feet per second and they have some kick with a muzzle energy of 485 foot-pounds. Remington manufactures all their products right here in the United States. They have numerous production facilities as well. North Carolina, Alabama, New York, and Arkansas just to name a few. They’ve even had Ghost Adventures tour a former ammunition factory in Bridgeport, Connecticut in 2009! That’s pretty cool. 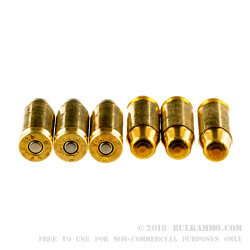 I was completely satisfied with the purchase I made from Bulk Ammo. The price was good, customer service was courteous. The Ammunition was shipped on schedule and arrived on time. I will order from Bulk Ammo again. I have practiced with UMC in the past. All aspects of the ammunition perform well, as I expected. I was slightly disappointed out of the 2000 rounds I did ordered two cartridges had noticeable flaws and one packing tray was missing one cartridge. I would still order UMC again. Q: Do you have any information on accuracy groups for this product and at what ranges? A: At 15 yards from a supported position, an average shooter should be able to keep all shots within a 3" circle. Q: I've always wanted to know the real difference between 165 GR and 180 gr when target practicing or using a round for home defense on a handgun. What are the advantages or disadvantages to the different grains? A: There aren't many differences between 165gr and 180gr .40 S&W ammo in terms of close range (0-25 yard) ballistics. When it comes to terminal performance, with good projectile designs, both are excellent choices. You might notice slight differences in the recoil characteristics - not that either one is bad, they might just feel a little different to you - and should sample (and test for function in your weapons) both before buying a lot of either.